Windows Phone 8 is going to be getting big updates to some key applications. One of the applications that is already integrated into Windows8 and will be heavily integrated into Windows Phone 8 is Skype, an obvious reality since Microsoft owns the company. 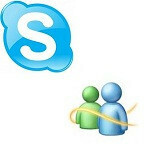 Skype has announced that users of Microsoft’s Messenger (Windows Live Messenger) may now connect their Microsoft account to the Skype client. Messenger is a heavily used service and coupling that user base with Skype creates a rather sizable user base. What is yet to be seen is how this new set-up will work with certain games and other features that exist with Messenger. Also, what has not been communicated is whether the whole Messenger service will migrate to a peer-to-peer setup like Skype, or if Skype will have server-based features enabled. While Skype is a capable communications client for calling and instant messaging, Windows Live Messenger has other features like the ability to initiate remote assistance sessions. As those issues are addressed, get used to the idea of Skype taking on the role, as Messenger will be retired in the first quarter of next year (except in China). You can merge separate accounts. Your buddy list will be integrated with your Skype list. Does anyone know if Skype actually closes in Windows 8? I find it very annoying to go into the task manager to close it every time I am done (on Windows 7). No it doesn't ever close. It is running even after you sign out of the application. It is running even after you turn it off. Heck if you shred your device, it still runs. OMG!!!! MY mom uses Windows Live Messanger!!!! If using a touchscreen, swipe from top of screen to bottom. That should close the application. That's what I do on my slate which i recently updated to Win 8 Pro. Good move on MSFT's part. Skype needs to continue improving, from good to great!